Most iPhone users take advantage of the awesome Clock application of their device and use their smartphone as primary alarm clock. If you wake up every morning with the help of your iPhone or iPad then chances are that you launch your favorite app as soon as you wake up. Many people check email, messages, social media accounts, news apps etc. as soon as they get up. 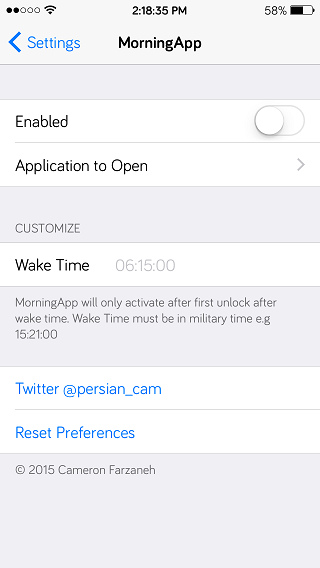 A new tweak called MorningApp makes launching your favorite app easier when you wake up. The tweak allows users to specify the application they usually launch first in the morning when they unlock their device, and launches it on first unlock of the day. From tweak’s settings page you can not only select the application that would be launched but also specify the time after which the app should be launched. The reason why it is good to specify the time as well is because you may want to only invoke this tweak after your alarm rings and not before it. So if you wake up with 7 o’clock alarm then enter 07:00:00 as your wake time on the preference page. The default time is 6.15 AM. The best thing about this tweak is that it is very specific and only launches the specified app after the first unlock of the device (after specified time). After that first unlock the device will act normally and you will be taken to the homescreen during rest of the day. MorningApp is a nice tweak that does something unique and useful. If you find it useful then you can download it from Cydia for free.